When I think of Sunday dinners, I think about comforting foods, a table full of love and laughter, and family. Some of my favorite childhood memories revolve around the dinner table, and I hope that the same will hold true for Caroline. Sometimes I'll cook a meal and it's just "right." The main dish and the sides all complement each other, the flavors play well off of each other, and its hard to pick a favorite dish on the table. My sister and niece are staying here for a while, and I thought it would be nice to cook a family dinner on Sunday after church. Since I've been featuring Thanksgiving-like recipes that don't involve roasting a whole turkey, I thought I would continue the trend. I found this recipe and knew that it would be a hit with both Caroline and my niece, but I was disappointed to see that the meatballs had an egg in them, since Caroline is allergic. No worries - I just subbed in 1/4 cup of pumpkin puree, and they held together beautifully. In my small amount of experimentation, pumpkin puree works the best as egg-substitute binders for meat and baked casseroles, but I like using flax or chia "eggs" in baking - or just adjusting the ratios to leave out eggs. In any case, Caroline chowed DOWN on these meatballs. Mashed potatoes have always been one of her favorite foods, but she left hers by the wayside to eat FOUR of the meatballs - that's how many I ate!! Speaking of mashed potatoes, I knew they were a must for the side, and I also made maple-mustard roasted green beans, which Joey has proclaimed to be the only way he wants to eat green beans from now on. The meatballs are very easy to throw together, and as a bonus, they cook in the oven rather than on the stove top. This is great for two reasons. One, they are healthier, and two, they are less labor-intensive and you don't have to worry about oil splatters. The cranberry-orange sauce goes really well with the savory herbed meatballs as well. I think this would be a great meal to make if you want the flavors of Thanksgiving without all the hassle. I also think they would make a great appetizer for a party - just make them a tad bit smaller and bake a few minutes less. Preheat the oven to 425 degrees, and lightly oil a baking sheet. In a small skillet, melt the butter over medium heat. Add the onion and celery, and cook until softened, about 4-5 minutes. Remove from heat and cool to room temperature. In a large bowl, combine the celery and onion, turkey, bread crumbs, pumpkin puree, oregano, poultry seasoning, parsley, salt, and pepper. Gently mix to incorporate with your hands. Using a cookie scoop, form the mixture in meatballs, and arrange them on the baking sheet. Bake 10 minutes, until cooked through. Meanwhile, make the cranberry sauce. combine the orange juice, shallot, cranberries, and sugar in a medium skillet. Cook over medium heat, until the cranberries pop and the mixture begins to thicken slightly, about 5 minutes. 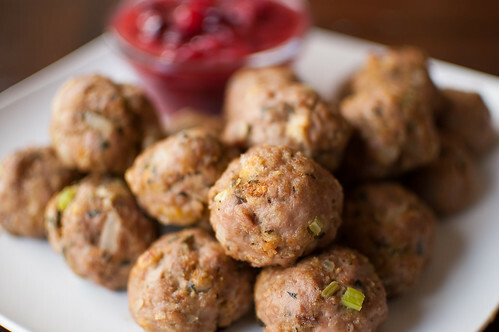 Serve the meatballs with the cranberry sauce. Those sound great! Makes me ready for next weeks big day! 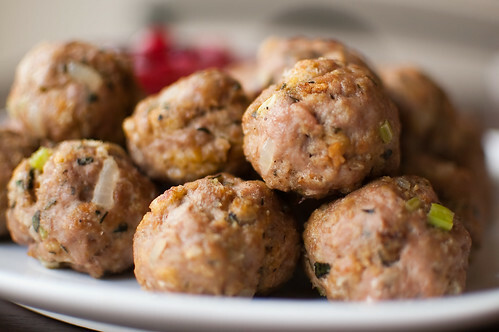 These meatballs sound great as do your maple-mustard green beans! Any chance you could share that recipe as well?? I was planning on making turkey meatballs tonight and happened to see this in my google reader. I whipped these up during lunch and they are delicious! Thanks! Has anyone used ground turkey breast rather than just ground turkey for these? I'm sure you could sub turkey breast, but I have not tried it. They might just be a little on the dry side. However, ground turkey is usually <10% fat, which to me isn't terribly fattening, considering that there isn't much other fat in this dish. Hope that helps!